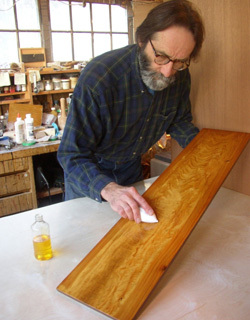 Wood Finishing Questions with Gary Wood - Goosebay Sawmill and Lumber, Inc.
Gary Wood will be here on Saturday, April 20, 2019 between 9am and 12 pm. Gary will be demonstrating the finishes that Goosebay stocks including the range of Fiddes Finishes, Real Milk Paint Company tung oil finishes, and GR Wood & Co. finishes (Gary’s proprietary brand. ) This includes oils, varnish, shellac, waxes, and dyes. Food-safe, exterior, interior, and durable finishes will be discussed, depending on your questions. Many of you have seen the sample finishes in Goosebay’s showroom. Gary will be talking about, answering questions about, and demonstrating how to achieve desired results with your finishing projects. Bring your questions and drop by anytime between 9 and 12; the format is very informal. There is no cost to attend this event. The coffee pot will be on. There will be a 10% discount on the above-listed finishes purchased on April 20.